Where in the World are ALL the Quilt Shops? We are certain that Carmen Sandiego made a point of hitting up the Quilt Shops in every town she passed through. Unfortunately, most of us will never have that chance! And since we just can’t bear the thought of that, we have decided to hunt those shops down and feature them right here on our blog. We will be scouring the country for quilt shops to inspire us all. in your neck of the woods! What and where are some of YOUR favorite quilt shops? 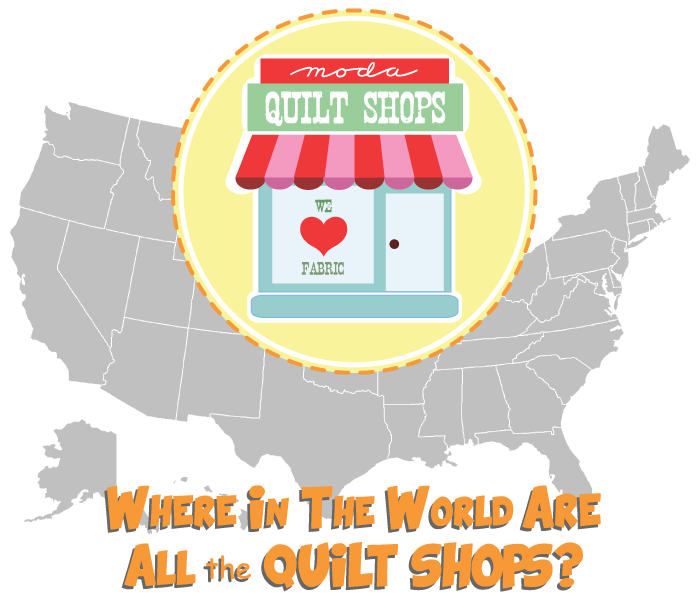 By Sarah CastanedaIn UncategorizedTagged Quilt Shop Locations, quilt shops131 Comments on Where in the World are ALL the Quilt Shops? Previous Previous post: RULER WINNERS!!! 4th and Main Fabrics in Cannon Falls, MN is awesome! Beautiful store! Rossville Quilt Shop (http://www.rossvillequilts.com/)in Rossville, Indiana is terrific! Rossville is a small town in the middle of nowhere but the shop & selection is the BEST…you’d swear they were smack dab in the middle of a big city for all that they carry! My quilting friend and I are taking a 50th birthday trip to CA next summer and you can bet we’ll be looking for quilt shops along the way! 3. Quilter’s Store Sedona in Sedona, AZ. These are all inviting shops, and each has a very nice variety of fabrics. Oh, one more thing. A quilter will find LOTS of inspiration at each of these shops! Three favorites- Yankee Cloth in Wallingford, CT, Sew Inspired in Simsbury , CT and Quilting By The Yard in Manchester CT. Unfortunately several have recently closed their doors. I love the Laughing Ladies Quilt Shop in Berthoud, Colorado. Wonderful place for fabric, fun and fellowship. Please, somebody help me find some in Shelby County, Alabama! I’m with Margaret on Jennifer’s Quilt Shop in Pinckney, MI. Cute as can be shop. Also The Stitchery in Howell, MI. The gals at this shop are wonderful. Always helpful and funny. This is such a wonderful idea. Please don’t forget us down south, as most of the amazing shops tend to be up north. Cabbage Rose near the cultural district in Fort Worth, TX. Calico Gals in Syracuse, NY is a friendly place with a great fabric selection. I live in Maine but visit Calico Gals whenever I’m in Syracuse visiting family. If you find any in Greece, will you let me know? I also have to cast my vote for The Laughing Ladies of Berthoud, CO…a great mix of fabrics, wools and embroidery along with the lovely embroidery thread!! and they are so friendly…. Wooden Bridge Dry Goods in Kutztown, Pa. Cute little Mennonite (I believe)quilt shop with a fantastic selection of fabrics, supplies, notions, etc. I’m so spoiled now that I can get these high quality fabrics locally! My favorite is actually 2 favorites. Quilt & Sew at the Golden Thread in Trenton KY – I think they’ve fit more amazing fabric selections into a small space than anywhere else I’ve ever shopped! Plus, wonderful staff, great classes, and delightful off-the-beaten-path location : ) And the best part is, they’re less than 2 hours from Paducah! Make sure you come to the NW. We have a great little shop with all Civil War fabrics in Independence, Oregon called Ladies of Liberty Mercantile. My favorite shop is Prairie Point Junction in Cozad, NE. Oh I have a few international favs! Addicted to fabric, Canberra, Australia. I love to support my local quit store! B-Right-On , Brighton, CO. Tomorrow’s Heirlooms, Westminster, CO, Holly’s Quilt Cabin, Centennial, CO and The Quilt Shop in Thornton, CO. All wonderful little shops and the friendliest people you will ever meet! Material Girls in LaPlata, MD is a fantastic shop with a wonderful bunch of ladies! Kathie’s Quilts in Sanford, Maine is also another great quilt store! I have the pleasure of living in several cities and have found unique shops in each one. 1) The Pine Needle in Lake Oswego, OR. 2) The Quilt Basket in Tucson, AZ. 3) Cotton Pickin’s in Stanwood, WA. 4) Quilted Strait in Port Gamble, WA. 5) Cloth and Quilts in Turlock, CA. It will be an enjoyable “journey” as you feature shops in other cities. My favorite quilt shop is Quilts Etc in Salt Lake City, UT. My second favorite is Pine Needles also in SLC, UT. Ryco’s in Lincoln RI, Emma’s in Franklin MA, Franklin Mill Store in Franklin MA, Charlton Sewng Center in Charlton MA, Appletree in Auburn MA, and sooo many more in Massachusetts. We are very lucky here! Hollyhill Quilt Shoppe in West Linn OR in the Old Willamette district. I think they may have been a top ten at one point. The shop is truly inspiring. The way Brian displays everything is beautiful. And – they have a wide selection so there’s something for everyone. Even though it’s just a few miles from me, I consider it a destination shop. I love Pine Needles in West Jordan, UT, Quilters Haven in Bountiful, UT, Corn Wagon in Springville, UT! 3 in my area. One in Lafayette, CA called The Cotton Patch – lovely selection, well laid out, good help. Another in Berkeley, CA called Stonemountain and Daughter – not so much a quilt shop but great fabric. The third is also in Berkeley – New Pieces – small shop, great fabric, super helpful people work there. I know there are even more, but these are the ones I frequent. Glenda’s Sewing Cupboard in St. Joseph MO. It a family quilt store that is growing in a country setting. A Scarlet Thread in McDonough, Georgia, is my favorite quilt store. It’s the largest quilt store in Georgia and the staff is so attentive and helpful! Every time I go to the store, I am inspired. Sew Unique in Mountain Home AR! they are on line too! SuperBuzzy in on Main St. in Ventura, CA is an amazing shop! She’s also online and has such an incredible array of fabrics. Fiddlesticks in Boulder City (South of Las Vegas near dam) has lots of civil war, 30s and lovely clearance for $5 or 6, Christmas Goose in North Las Vegas Civil War, 30s and 1/2 price clearance and Quiltique in Henderson (South Las Vegas) awesome abundance of batiks!! My very favorite Quilt Shop is Sandy’s in Punta Gorda, florida. Kathy and Nora are so very friendly and have pleny of new and old fabulous fabrics. Best quilt shows near them. Also . . . Kapaia Stitchery in Lihue, Hawaii on the island of Kauai is an amazing shop with wonderful people! Stash, Walla Walla Washington…..the best, in my opinion the best quilt shop I have ever been to…..I travel an hour and a half to get there…..
Quilts By Phyllis, Hurricane, WV is the best! The Sew So Shop in Yuba City, Ca. Amazing fabric and super helpful staff. The Stitching Post in Washington IN. A very complete store and friendly owner and employees. My top priority after moving to Colorado (military move) was to learn to quilt. I luckily and accidentally stumbled upon a small quilt shop, The Creative Cloth Closet in Canon City, within the first couple weeks of being here and signed up for a beginners class which changed my life! The ladies there have been so welcoming, helpful and supportive. I’m so happy to have a close resource and outlet, especially to fill my time while my husband is on deployments. I love Quilts, Etc. in Sandy, Utah. Country Lady Quilt Shop in Roseburg, OR. Over 1,000 batiks with new ones arriving every month. Also Finally Together Quilt shop in Lebanon, OR. Extremely helpful and friendly staff. are my two go to shops within 30 miles of my house. For a worthwhile road trip my BFF’s and I love to go to Quilted Threads in Henniker, NH or Cottonweeds in Freeport, ME. There’s nothing better than shopping at a quilt shop! Cotton Candy Quilt Shop in Muncie, Indiana is relatively new but growing and they have such a nice staff. I even learned to tat there. Marketplace Quilts in Salem Massachusetts. The owner, Maureen is very helpful and everyone is very friendly! Favourite Quilt Shops in the beautiful north of Canada for me are: Quilters Cupboard in Uxbridge, Ontario and Ultimate Sewing Centre in Oshawa, Ontario. Great staff, friendly advice and very knowledgable, oh and awesome fabrics, notions and supplies!! Margie Pearls in Bolivar, MO , great selection, great prices. Sew Sweet Quilt Shop in Brunswick MO. Creative,helpful owner and workers and a wonderful variety of fabric! In Washington State my favorites are the Quilt Barn in Puyallup and the Wild Rose Quilt Shop in Orting. In MN there are 3 – Bay Window in Perham, Red Pines Quilt Shop in Detroit Lakes, and Gruber’s Quilt Shop in Waite Park. In NC – my favorite is Quilting Quest in Lexington. At home it’s Picket Fence in Harlingen. Three in Michigan, Mabelena in Ortonville, Lake Street Mercantile in South Lyon and Bittersweet in Pinconning! I live in rural Georgia–below the gnat line!– and quilt shops are not thick on the ground! One of my favorites is A Scarlet Thread, which is quite well-known–just look for the billboard on I-75. The other is worth hunting for—Marti’s Fabric Studio in Jesup, GA. Marti makes everyone feel special, and she’s special herself, helping create a barn quilt trail and sponsoring the area’s Dress a Girl Around the World. (Jesup also is home to the best donuts I’ve ever encountered at Sugar & Spice). You should check it out! I am so lucky to live/work near all these great shops & many more! I have two. Julie Ann Fabrics and More, and Patches & Petals in Cadillac Michigan. Lots of gorgeous fabrics, projects, quilty/sewing stuff, great classes and the marvelous Carl and Linda! Yep, Linderella’s, http://www.linderellas.com/ is my local shop in Southern Pines, NC and I love it. It’s beautiful, bright and airy in the shop AND the classroom – lots of windows. Carl and Linda are great. Their enthusiasm for the fiber arts is contagious – they are always bringing in the latest and greatest in fabrics and patterns and cool ideas and offer a range of classes to suit just about everyone, I’d say. My favorites are Rather Bee Quilting in Lake City, MN, Grubers in St Cloud, Mn and Jackman’s in St Louis, MO just to name a few! My favorite is my local quilt shop – Peggy’ s Sewing Center in Centerville, Maryland. Peggy is amazing! I enjoy Inspire! in Plant City, FL and the Sewing Studio in Maitland, FL – great shops with quite a variety of fabric that is constantly being updated! My two favorite is Cabbage Rose in Fort Worth, Tx and Country Stitches in Burleson. Everyone is always so friendly and willing to help. I love Quiltique in Las Vegas, NV. It’s a beautiful shop with so much fabric that is organized in an appealing and user-friendly (by line and color, with the FQs displayed with them) way. Whenever I’m in Vegas, I always visit. But I also have a new love, which I discovered this summer, and that one is The Quilt Vine in Trappe, MD. This shop is adorable. In an old Victorian house, it’s surprisingly filled with bright and modern fabrics, with a helpful staff and beautiful models of all quilting types and styles. Tiny Stitches, Marietta, GA is my favorite shop. Katja’s Quilt Shoppe in Kamloops, BC, Canada. They have lots of selection, including one of the best Moda precuts selection available in BC. Can you tell we stop along the way when we travel? Quintessential Quilts in Reedsberg, Wisconsin. An older house where each room is dedicated to a fabric color. Patched Works in Elm Grove, WI, just outside of Milwaukee. Everything a quilter could dream of from fabric to books, patterns to notions. Walls are lined with sample quilts and more! So inspiring and exciting! My favorite shop to purchase fabric is Quintessential Quilts in Reedsburg, Wi. Walking into the next room gives you totally different ideas, as each room is dedicated to a different color. However, my all-time favorite “quilt shop” is my sisters building that we get together in almost every Saturday to create. I love the Tater Patch in Merrill, Oregon– heart of potato country! They all have fantastic staff, lots of display quilts and a wide variety of fabric. Cut Up and Quilt in Council Bluffs, Iowa. Folks are sooo nice there and they have all the new fabric! My favorite is Quiltique in Henderson,(Las Vegas Area) NV. It’s a bright, beautiful shop with over 5,000 bolts of fabric that is organized in an appealing and user-friendly (by line and color, with the FQs displayed with them) way. Lots of modern styles and half-priced sale racks. They are a Bernina dealer and have a great service department. Cotton Patch Quilt Shop on Copper Creek Blvd in University Park, Florida! Friendliest staff with a nice selection! What a great idea! We are a quilt shop in Lutz, Fl. and this seems like a great way to bring business to some of the small business quilt shops! Way to go Moda! Love the Among Friends Quilt shop in Louisville, KY. They have a great selection, lots of current collections and great classes. The staff there are always amazingly helpful too! Fern Hill in Amana Iowa. My 2 favorites are Aardvark Quilts in Morris Plains, NJ, and The City Quilter on west 25th Street in NYC. Very different from each other, but both have lovely fabrics. Generations Quilt Shop in Pottstown PA – they have all the trendiest quilting fabrics! Momma Made It,Longview Washington USA. A Quilters Oasis in Mesa AZ. They have expanded recently and have a wide variety of fabrics to choose from! I love “A Quilt of Many Colors” in Leo, IN. Small shop but very friendly owners. I also like “Fabrics and Friends” in Roanoke, IN. Large selection of fabrics and friendly staff. BARE?? as in bear the thought????? duh.. where is the copy writer?? I have a wealth of wonderful LQS! Love, love, love Scrap and Sew in Lutz, Florida!! Tess is always helpful and carries the latest patterns, notions and fabrics. Tons of Moda to choose from! I live in western NY state, but I go there when I am visiting in the area. The shop a lot of brighter fabrics, Kaffe and Batiks. Love it!! Oh you must mention and visit FRONT PORCH QUILT SHOP in Ozark, Alabama, featured in Spring 2013, Quilt Sampler! The very best shoppe in Alabama! Burkholders Fabrics, 1 Sportsman Rd. Rte 897 Denver PA are shops in my area. Lyons Quilting in Lyons, Colorado made it through the flood unscathed! From what I’ve gathered, the owner Tracy recently purchased the stock from the former Lyon’s quilt store where she also worked and moved the store and opened just before the flood rushed through Lyons. Incredibly the building they are in made it through the flood, and they are open for business. They are stock full of all sorts of wonderful fabrics. Agree with Laughing Ladies in Berthoud as well. In the US, my favourite store is Web Fabrics in Purcellville, VA. Conveniently close to Dulles Airport for those of us flying in from the UK and really good prices. I fit in a visit every time we go the Washington DC. In the UK, I do not have a favourite local store (I visit them all from time to time) but I do like Fabric Guild which is in a warehouse in Leicester. No frills, but good prices. Both awesome shops in the Metro Atlanta area. If you’re ever in Pensacola, Florida, you have to visit A&E. A&E seems a bit unusual because from the OUTSIDE, it’s just an old-timey drug store. When you first walk in, it STILL looks like an old-timey drug store, complete with dispensary at the back of the store. But if you hang a left and head toward the back – WOW! Thousands of bolts of beautiful, modern fabric. Check it out! Sew Graceful in Rogers Arkansas. Tons of samples, lots of moda and wool. Primitives abound. Corner of Pennsylvania and Britton. Keepsake Cottage, located in Country Village, in Bothell, Washington, is a cozy cottage with rooms full of themes of fabrics. Your first stop will likely be to peruse the sale and close out specials on the front patio. Inside, friendly, knowledgeable staff will help you find what you need from the Baby/Kids room, the ’30’s room, which has great big windows and natural lighting, and more rooms overflowing with fabrics, threads and notions. These ladies are always happy to help, sharing their knowledge, ideas and suggestions, even if you are stuck and don’t have or know what you need. After loading up on tons of great Moda Fabrics and Precuts, wander through the various shops and restaurants, feed the ducks and chickens who live in the Village and have your child ride the train or see a show at the children’s theater, before stopping for some delicious made-on-sight kettle corn or enjoying High Tea in the English Tea Room. It’s variety and monthly Ladies Night events make going to the quilt shop more than just buying beautiful fabrics.